The National Union of Students created the NUS Extra scheme in 2006 to allow eligible students to get exclusive discounts with the purchase of an NUS Extra membership. Around 95% of student unions from higher education institutions in the UK affiliate with NUS. Students attending these institutions can join NUS and buy the discount cards. 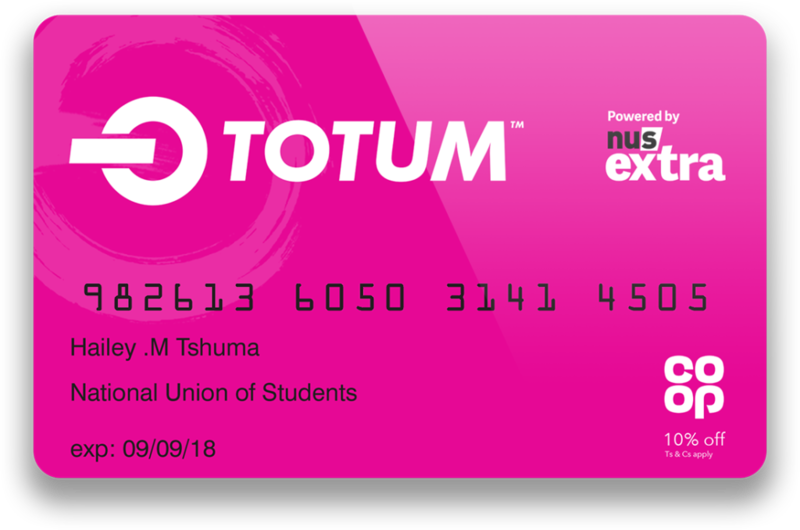 From August 2018, NUS is replacing NUS Extra with TOTUM. This is the same as NUS Extra but with a new look, new discounts, and a mobile app. Students can buy membership cards in the same way, but can also have a digital version of the card on their phones. Cards are available for 1,2, or 3-year memberships. Students will have to renew their membership to continue using the card. NUS Extra cards are still valid until their expiry dates. After this, renewal will create a replacement TOTUM membership. It is your responsibility to look after your NUS Extra card or TOTUM card. If you lose it or somebody steals it, then you must contact NUS to request to get a replacement card. If you are renewing your NUS card, then you will have to pay the full price for the next membership length. This is £12 for 1 year, £22 for 2 years, or £32 for 3 years. You will also have to pay £1.50 for home delivery on top of this. When you lose your physical card within 28 days of its due expiry date, you might simply want to renew it. You can still use your digital card in the meantime if you have the TOTUM app. If you do not have the app and you need a replacement physical card to use in the next month, then you will have to contact NUS. Prior to this 28-day window before the expiry date, you can go to the TOTUM website and enter your e-mail address. It will prompt you to order a replacement card for a cost of £5 up until that point. Bear in mind that replacement cards purchased this way will have the same expiry date as your current card. It is not a renewal, so you will still have to renew the card and pay the full fee when it expires. The only way for you to get a replacement NUS card for free is if your card was stolen, and you have a crime reference number from the police. You must contact NUS and provide the crime reference number in order for them to issue a free replacement NUS card. Again, it will take up to 10 working days to get it.